Tuesday February 15th 1921 I wrote to Ott and read some. Then rode over to Daytona with Mr Dunlap. He took us out to dinner and we rode most of the afternoon. Some friends of Mrs Miller were with us who knew Warner McCall in River Forest. In the evening. Mrs Miller and I went to a fine concert. Wednesday February 16th 1921 We left Daytona about ten oclock. Mrs Marrion Dunlap and two other ladies went with us for the ride. Such a pleasant one. I found Mrs Falk alone and we had a fine visit before the family (she now has) with Mr Falk came back from The Orlando Fair. 20 years today we went to Coralville to live. Thursday February 17th 1921 Mrs Falk and I went down town when Mr Pickens took Myron to school. We called on Mrs Bunn. I bought a trunk. After dinner Mrs Falk made called. I went to the Library and wrote a letter to Hattie and sent some cards. We came home at 4 oclock. 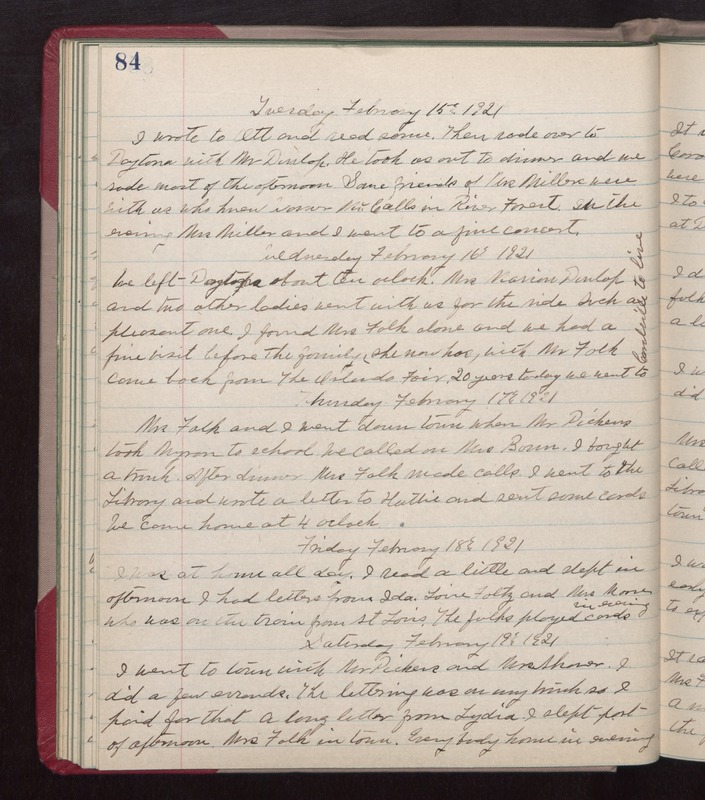 Friday February 18th 1921 I was at home all day. I read a little and slept in afternoon. I had letters from Ida, Lorie Foltz, and Mrs Moore who was on the train from St Louis. The folks played cards in evening. Saturday February 19th 1921 I went to town with Mr Pickens and Mrs Shaver. I did a few errands. The lettering was on my trunk so I paid for that. A long letter from Lydia. I slept part of afternoon. Mrs Falk in town. Every body home in evening.